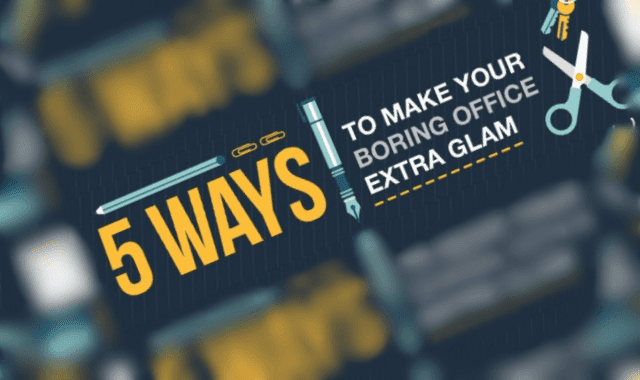 5 Ways To Make Your Boring Office Extra Glam #Infographic ~ Visualistan '+g+"
We work at our desks day in and day out, usually with the same old furniture and office supplies. If your desk space is looking a little drab, we’re here to help. We’ve rounded up five simple, cost-effective ways to make your office a little extra glam. Adding pops of gold and rose gold office supplies, texture from faux fur, and hints of sparkle can all add some glitz and glamour to your workspace, without breaking the bank or requiring a ton of free time. Read on for our simple DIYs and soon you can be the envy of all your coworkers.